Our range of products include vinay silkina 8 salwar kameez, churidar salwar kameez, fancy salwar kameez, salwar kameez, unstitched salwar kameez and srusti kalamkari suits. Our organization is among the leading names in the industry, engaged in offering a wide assortment of Vinay Silkina 8 Salwar Kameez to our valued clients. The offered ranges of products are extremely comfortable and perfect in terms of fitting. These products are made from finest quality raw material as per the set industry norms under the assistance of our highly skilled professionals. These products are highly demanded in the market for their unmatched quality and optimum performance. Churidar Salwar Kameez offered are made available in designer finish which makes these all the more desired and demanded by the customers. Providing for exciting dressing choice, these suit options also support lending grace and glamour to the dressed looks of ladies flaunting it. Some of its features include provide for sense of exclusive style and rich presentable looks; adds grace to wearer’s personality; coming in vibrant color choices; classy finish and durable usage value. As a quality-driven firm, we are focused to provide our clients with a stunning Fancy Salwar Kameez, Fashion Salwar Kameez. Well known for its attractive and decent look, this salwar kameez goes well with designer outfit. Our offered salwar kameez is precisely designed using quality assured fabric and high end techniques by our adroit designers. Clients can avail this exclusively designed salwar kameez from us in lots of designs, colors and patterns at rock bottom prices. As a quality-driven firm, we are focused to provide our clients with a stunning Salwar Kameez, Well known for its attractive and decent look, this salwar kameez goes well with designer outfit. 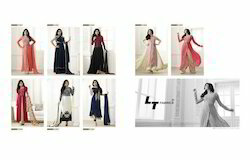 Our offered salwar kameez is precisely designed using quality assured fabric and high end techniques by our adroit designers. Clients can avail this exclusively designed salwar kameez from us in lots of designs, colors and patterns at rock bottom prices. We are manufacturer and supplier of Unstitched Salwar Kameez for all purpose wear with vibrant colours. For meeting the ever growing demands and needs of customers, we are engaged in manufacturing, supplying and wholesaling Pure Silk Salwar Suits. These suits are ideal for wearing in daily routine life as well as in parties. Our suits are designed by expert professionals in strict compliance with modern fashion trends. 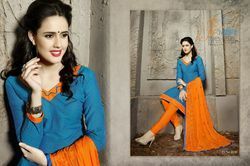 Our company has mastered the art in offering Avon Aarohi Georgette Salwar Suit to the clients. Salwar Dress Material is designed using fine quality material and advanced technology as per the quality standards. This product is treasured for attractive color combinations, colorfastness, shrink resistance, light weight and softness and widely acclaimed by the clients.